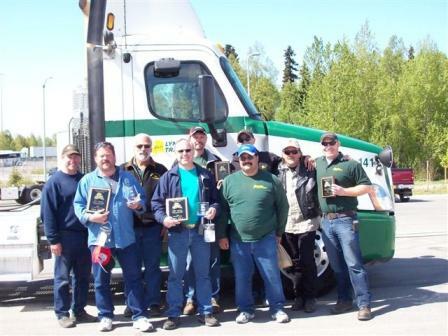 Lynden drivers ruled the road at the May 21 Alaska Truck Driving Championships in Anchorage. Competitors were required to complete a written exam, a pre-trip inspection and an obstacle course. Tom Martin of Lynden Transport took first place in the Day Cab division and placed third overall, and Brian Ambrose of Alaska West Express took first in the Sleeper Berth category and finished second overall. Other top drivers were Lynden Transport’s Don Harrison who placed third in the Day Cab division and Jered Post, taking third in the 3-axle category. Brian and Tom are now preparing to compete in the National Truck Driving Championships August 3-7 in Columbus, OH. Brian has driven for both Lynden Transport and Alaska West Express over the years, and he says he’s always been conscientious behind the wheel. “You have to be on your game every day. You can’t afford to have a bad day,” he explains. “I take pride in doing a good job, and although the competition will be tough in Ohio, I think I can handle it,” he predicts. Tom is a 16-year Lynden Transport veteran. “I’ve always been competitive, and I enjoy testing my skills,” he says. This was his third year participating in Anchorage, and he said he’s excited about competing on a national level. We will keep fans of the Lynden Facebook page updated with the results of the competition. Good luck, Brian and Tom!